The Philippines has today (Thursday, July 27) taken possession of two brand-new surveillance aircraft, courtesy of the United States. The two Cessna C-208B Grand Caravans, worth $33 million, are capable of intelligence, surveillance and reconnaissance. They can fly for five-and-a-half hours on a single tank of fuel. 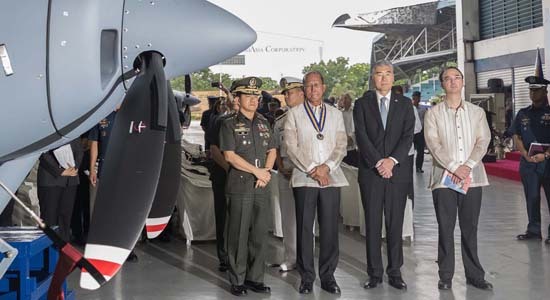 The aircraft will be used to boost the Philippine military’s counter-terrorism efforts, internal security operations, law enforcement and disaster relief operations. American ambassador Sung Kim handed the planes over during a ceremony at the Villamor Airbase in Manila today. Foreign Affairs Secretary Alan Peter Cayetano, Defence Secretary Delfin Lorenzana and Armed Forces of the Philippines (AFP) Chief of Staff General Eduardo Año were present at the hand-over. Mr Lorenzana said President Duterte could not make it to the ceremony because he had “scheduled trips” elsewhere. In his speech, the ambassador said the donation was a symbol of the “strength and enduring nature” of the long-standing US-Philippine alliance. He also said the US had recently delivered arms and ammunition, including bombs, rockets, pistols and grenade launchers. Further intelligence and surveillance equipment would be given to the military in the coming months, he added. He also described how the US wanted to “help Marawi residents get their city back and start their lives over in a safe and stable environment”. The occupation of the city by Islamic State-linked terrorists, which erupted on May 23, is ongoing. US special forces have been spotted near the combat zone offering “technical assistance”. Mr Lorenzana thanked the US for its support to the AFP, saying the planes would serve as deterrents to communists, terrorists and extremists. “The planes are the first of its kind, the most modern that we have. Wala naman tayo kasing state of the art,” he said. The US has continued to provide aid and military assistance to the Philippines, despite President Duterte’s open distain for the country. He has often spoken out against the USA, particularly over its criticism of his war on drugs. During his State of the Nation Address (SONA) on Monday, he turned to history to demand that America return church bells that its soldiers had taken from Balangiga, Samar, as “war booty” during the Philippine-American war in 1901. Asked to comment on the president’s attitude towards the USA, Mr Cayetano said he “valued” the long-standing alliance. He also said that the president’s oft-repeated statement that he didn’t want foreign troops on Philippine soil was merely an “aspirational statement” not directed at US troops. He added that the Visiting Forces Agreement and the Enhanced Defence Cooperation Agreement, which allow the “rotational presence” of US troops, were still operational, and that the president was not forming any new military alliances.